In this blog I described the first results from the Planck satellite, which is studying the Cosmic Microwave Background in greater detail than we have ever done before. 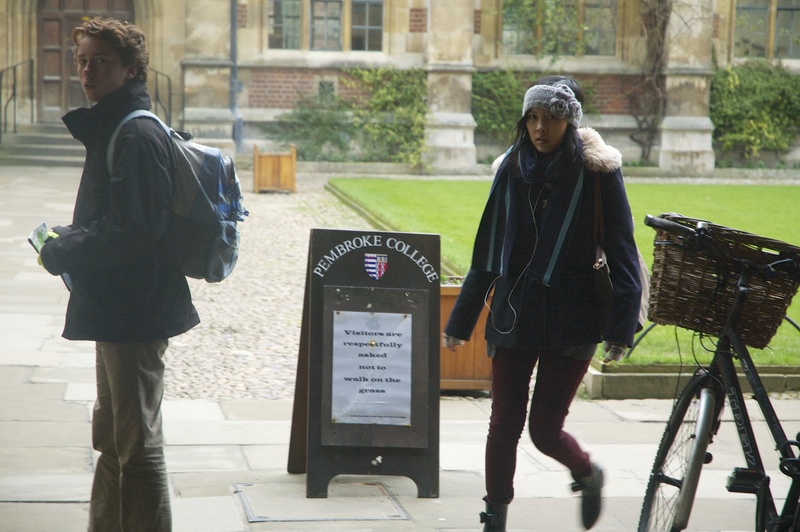 But, what exactly is the Cosmic Microwave Background? Where does it come from? How was it produced? In 1929 Edwin Hubble published evidence that the speed with which galaxies were moving away from the Milky Way was directly related to their distance from us. Although Hubble himself never explicity stated it, this is clear evidence that the Universe is expanding. If the Universe is expanding, then of course one would expect it to have been smaller in the past. In the 1940s the Russian-American physicist George Gamow started thinking about what the early Universe would have been like. 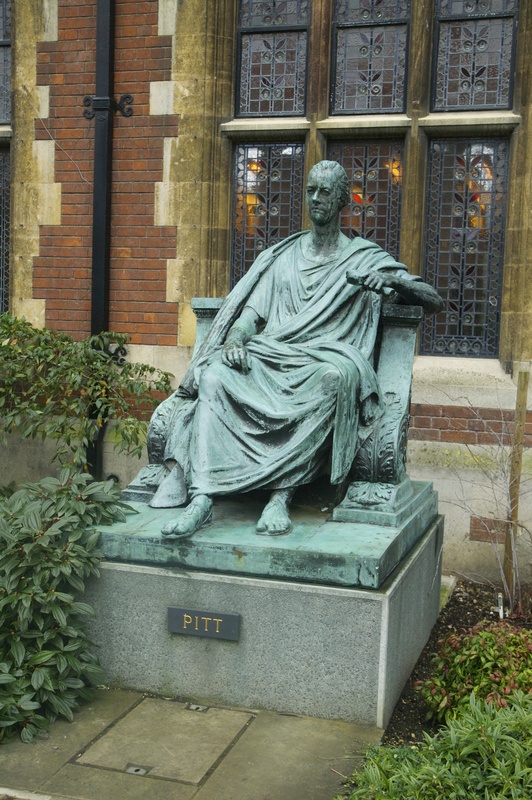 He worked on two related theories, the first that the elements would have been created in the early Universe. 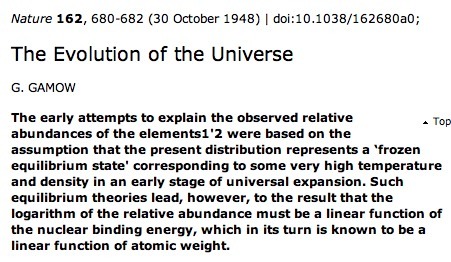 The second related to the fact that a smaller, denser Universe would also have been hotter in the past. 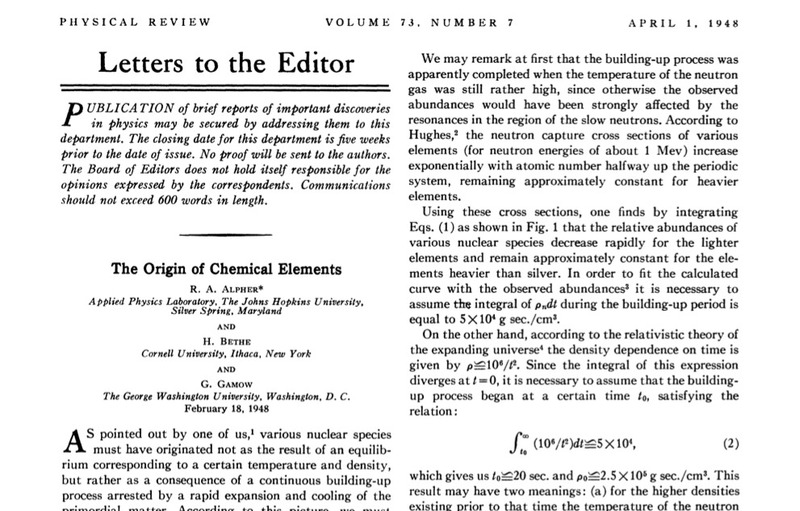 In 1948, with his PhD student Ralph Alpher, the two published a paper titled “The Origin of Chemical Elements“. As a joke, Gamow decided to add the well-known physicist Hans Bethe’s name to the paper, so that it could be called “Alpher, Bethe, Gamow” (alpha,beta, gamma – geddit? 🙂 ). 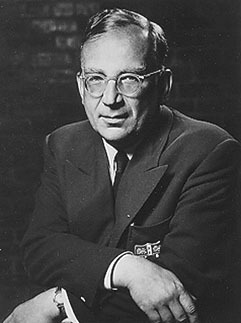 George Gamow, who worked with his PhD student Ralph Alpher on the primordial nucleosynthesis theory. 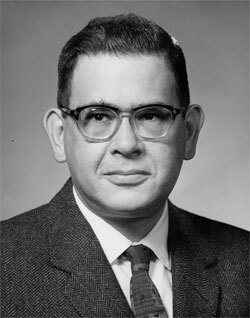 Ralph Alpher, who was George Gamow’s PhD student at the time of writing the paper. 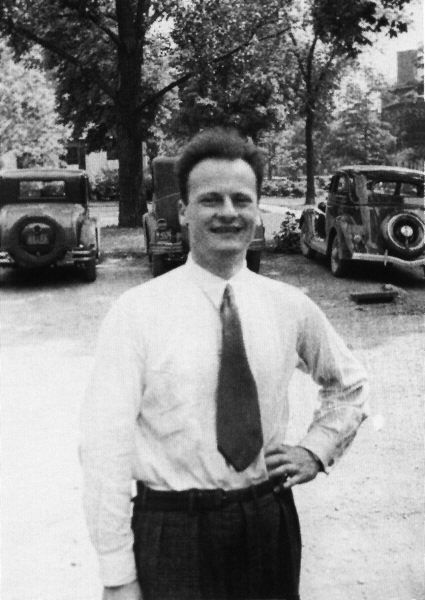 Hans Bethe, who played no part in writing the paper. 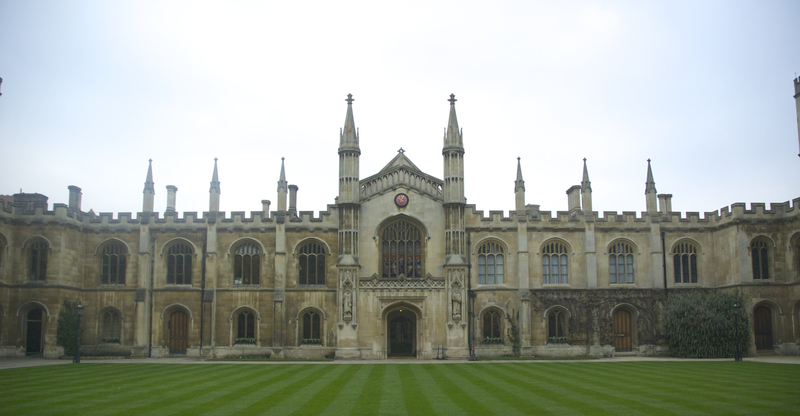 Although the Alpher, Bethe, Gamow paper was groundbreaking, it was wrong in some of its details. It suggested that all the elements were created in the hot, early Universe. We now think (know?) this is not the case. Only hydrogen and helium were created in the early Universe, the other elements have all been created inside stars, something Sir Fred Hoyle worked out with co-workers in the 1950s. In a related paper, Alpher and Robert Herman, who was working as a post-doctoral research assistant for Gamow, calculated that the early Universe would have been a hot opaque plasma (ionised gas), and would thus have radiated like a black body. However, this radiation would not have been able to travel through the plasma as the photons would scatter of the free electrons. The abstract of the paper by Alpher and Herman, which predicts a cosmic microwave background at a temperature of 5K (5 degrees above absolute zero). But, as the Universe expanded and cooled the plasma would become a neutral gas, in that the electrons would combine with the nuclei to produce neutral atoms, allowing the photons to travel unimpeded. They calculated that these photons, which would be able to thence travel unimpeded, would now be at a characteristic black-body temperature of 5K due to the expansion of the Universe. This in the microwave part of the spectrum, hence the name Cosmic Microwave Background. Our current understanding is pretty much what was derived in this 1948 paper, with a few refinements. Perversely, the moment the plasma became a neutral gas, which we believe to be when the Universe was about 350,000 years old, is referred to as “re-combination”, but as I tell my students, the electrons were combing with the nuclei for the first time. This is when the fog of the early Universe lifted and is the earliest radiation we can see. 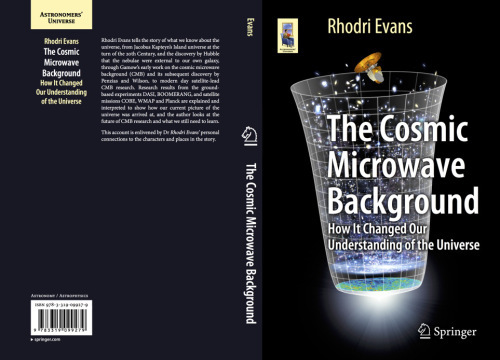 You can read far more about the prediction of the CMB, and its accidental discovery, in my new book, “The Cosmic Microwave Background – How it changed our understanding of the Universe”. The book can be found on the Springer website here, and on the Amazon website here. 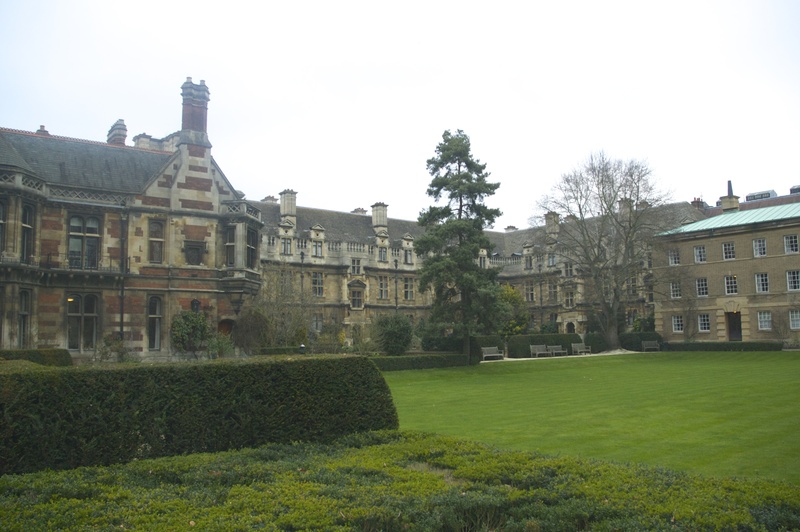 I was in Cambridge in early February with my son, and on our 3rd day there we went out to the Cavendish Laboratory and the Institute of Astronomy. 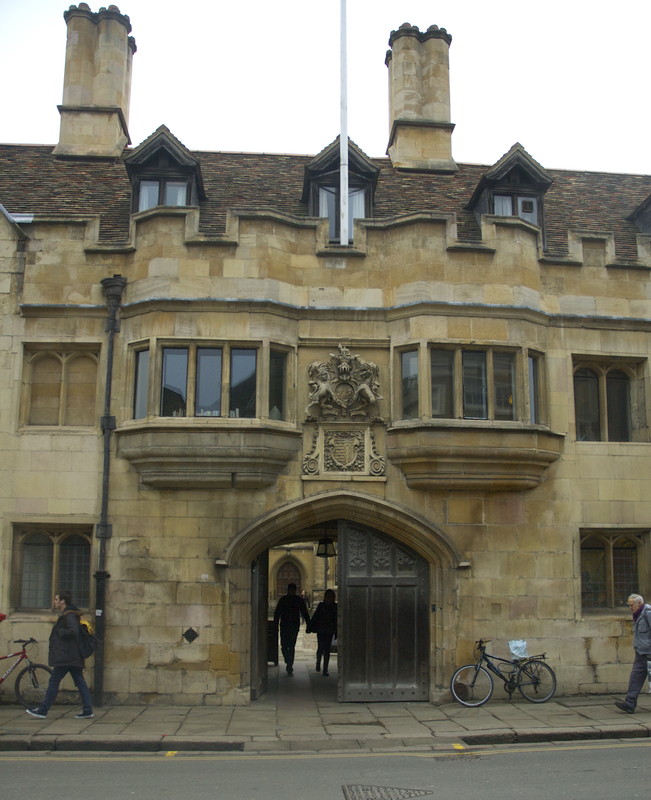 In the road that runs from the main road to the Cavendish is JJ Thomson Avenue. 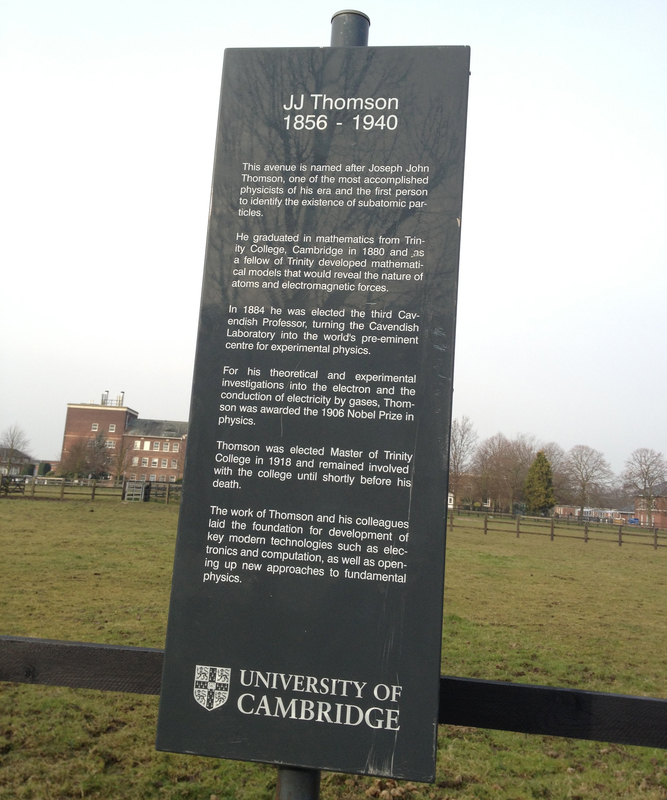 As this picture shows, the avenue is named after the famous English physicist J.J. Thomson. 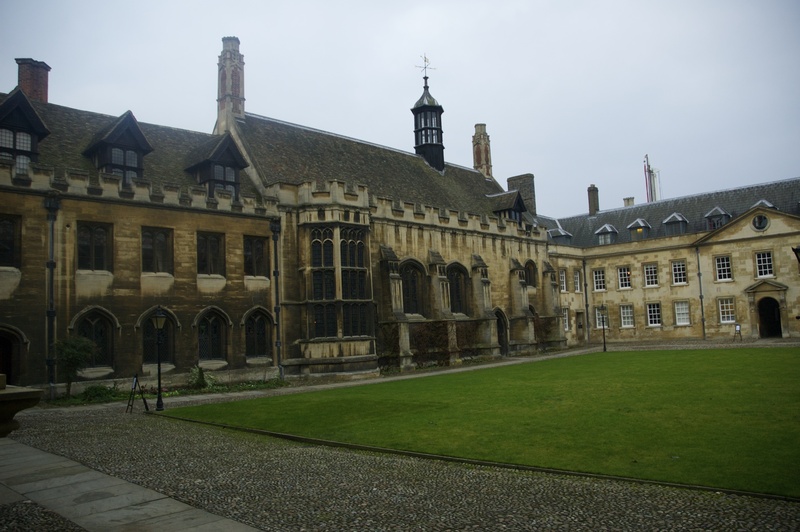 In 1897 J.J. Thomson discovered the first sub-atomic particle, the electron. He was doing experiments with cathode ray tubes, which had been discovered in the mid 1880s, and decided to see how they might be affected by magnetic and electric fields. He found that the cathode rays were deflected by the magnetic and electric fields, showing that they must be made up of charged particles. A cathode ray tube. Electrons travel from the negative end (the cathode) towards the positive terminal (the anode). 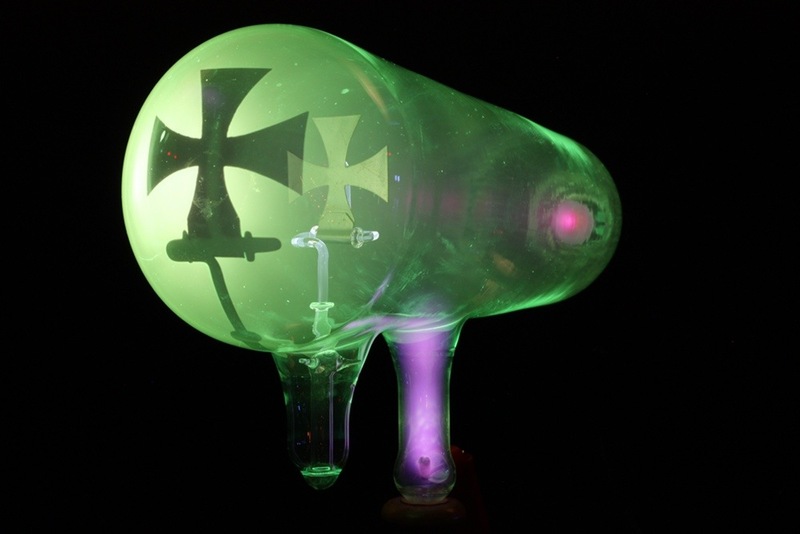 The green glow is produced by the charged electrons interacting with phosphorous in the glass, which then fluoresces. The shadow of the Maltese cross appears on the glass. 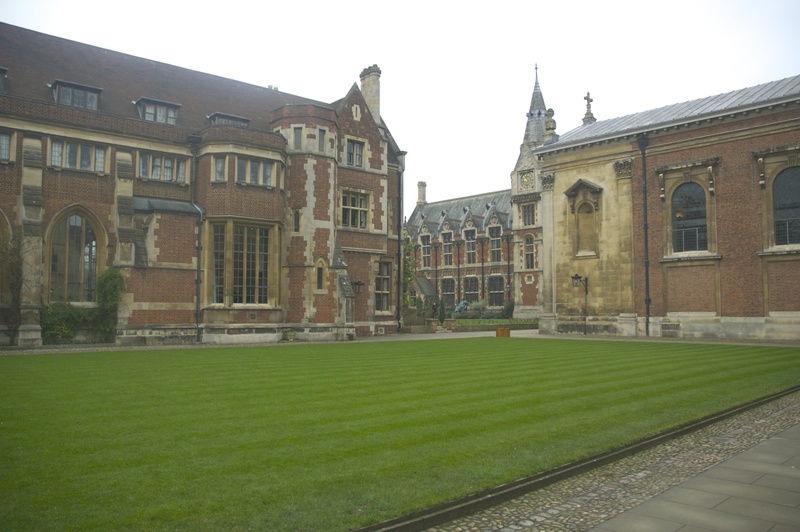 More than this, be was able to measure the shape of curve produced by the fields, and using the known strength of the fields he used, was able to calculate the mass and charge of the particles. By this time, chemists had fairly accurately determined the masses of atoms, and had shown that e.g. Carbon had a mass some 12 times the mass of Hydrogen. Thomson found that the mass of the particles he was deflecting in his magnetic and electric fields werethousands of times less massive than the mass of the lightest known element, Hydrogen. This of course indicated that what he had discovered was sub-atomic, a constituent of atoms. Thomson thus showed that cathode rays are a stream of electrons. The very high voltage (thousands of volts) between the positive (anode) and negative (cathode) terminals causes electrons in the cathode to be accelerated to a high velocity as they are attracted towards the anode. Cathode ray tubes were the basis for most TVs and computer monitors until this last 10 years, when more efficient Liquid Crystal Displays have largely replaced them. As I will describe in a future blog in more details, some 12-13 years after Thomson’s work, one of his ex-students Ernest Rutherford showed that most of the mass of an atom resides in the centre, in its nucleus. The electrons orbit the nucleus, but it is the electrons which are important in e.g. giving elements their chemical properties and forming bonds with other atoms. One anecdote about Thomson is that he used to get annoyed when people would write to him and spell his name with the more traditional “p” in it, Thompson. In replying to any such correspondence, he would insert random letter “p”s into the person’s name. 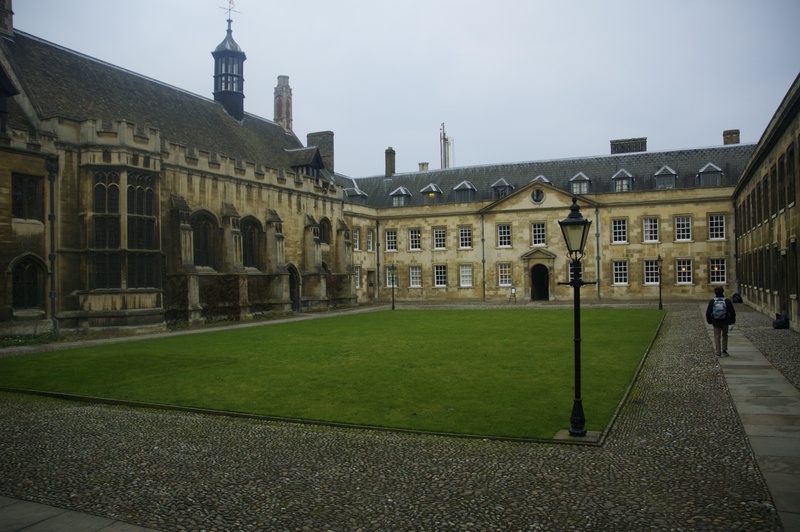 In early February my son and I went to Cambridge, as he will be applying to university in about 8 months and so wanted to see if he would want to be a student there. 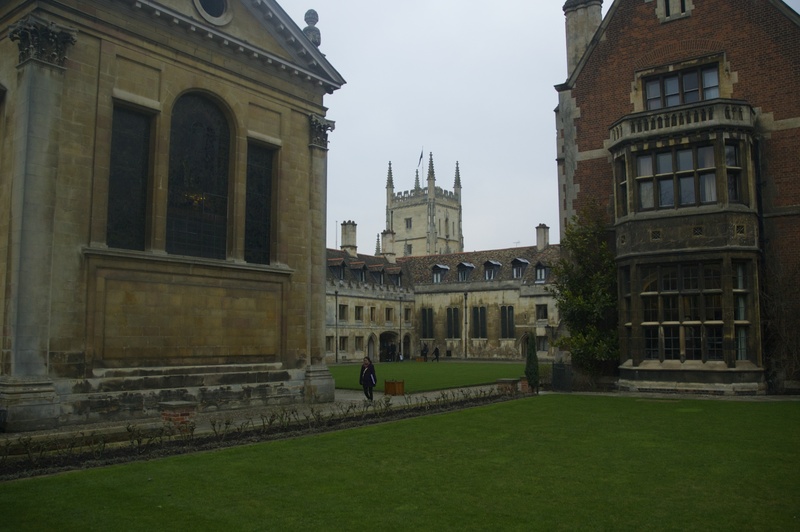 Here are some photographs of 3 of the colleges we visited, Peterhouse, Pembroke and Corpus Christi. 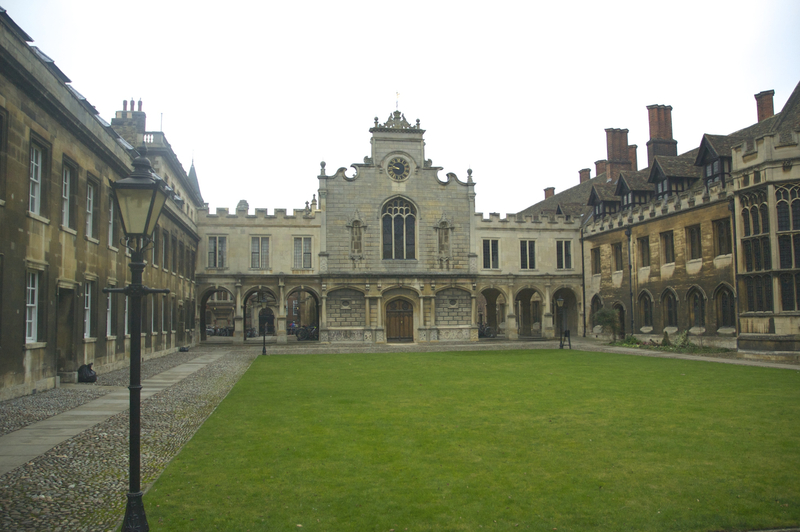 Peterhouse College, Cambridge, established in 1284. 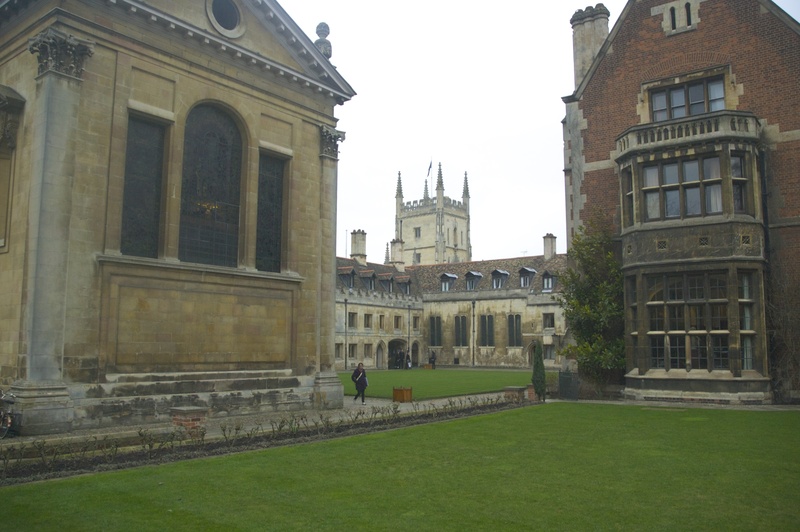 In February I was visiting Cambridge with my son so that he could see if he wants to apply there for university next year. 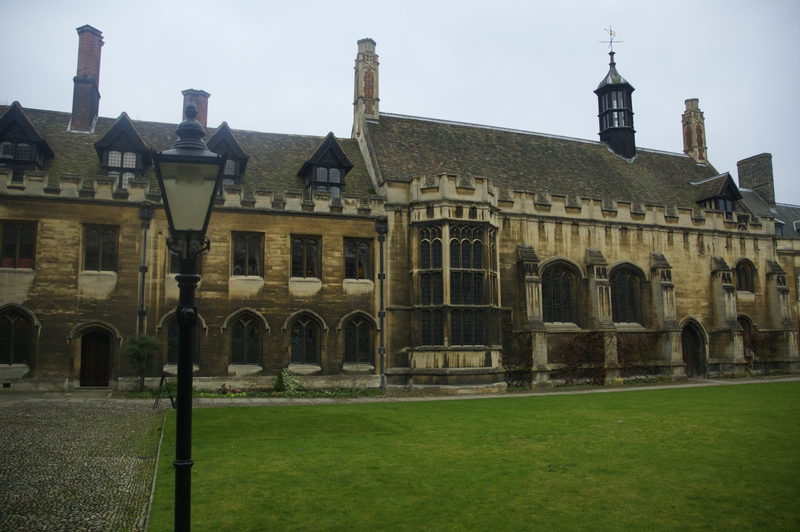 On the last day of our visit, we managed to go into Trinity College’s historical library, which is known as the Wren library (as it was designed by Sir Christopher Wren). 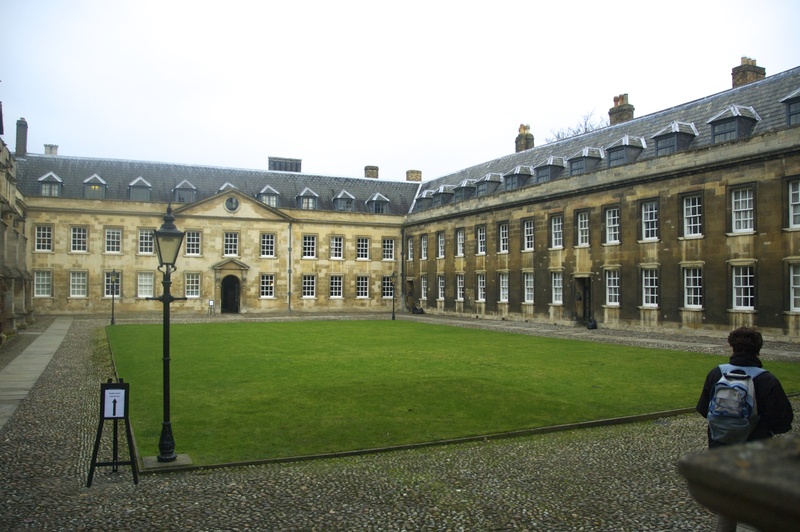 The highlight of this library for me was a copy of Newton’s personal first edition copy of his Principia Mathematica book, which introduced such important topics as calculus and his three laws of motion. For clarity, I should give the book its full title, Philosophiae Naturalis Principia Mathematica, as Bertrand Russell co-authored a book called “Principia Mathematica” in the early 20th Century. 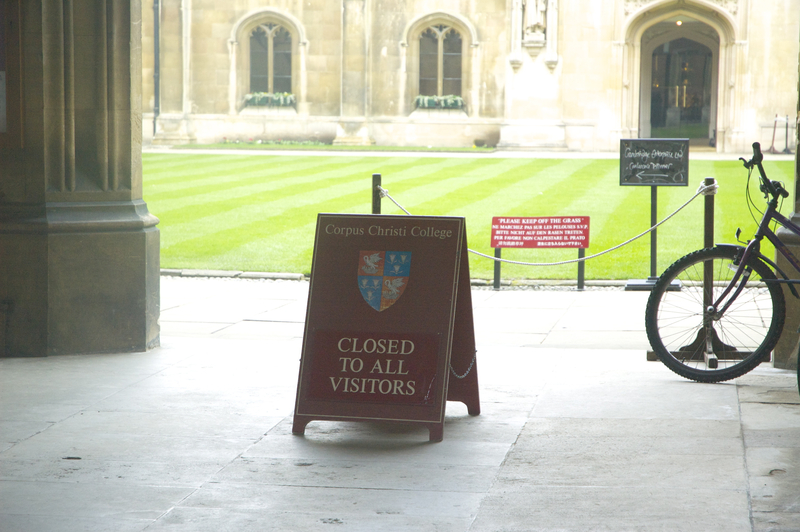 Unfortunately, as the sign below shows, one is not allowed to take photographs in the library, so I only have a mental image of this wonderful sight. 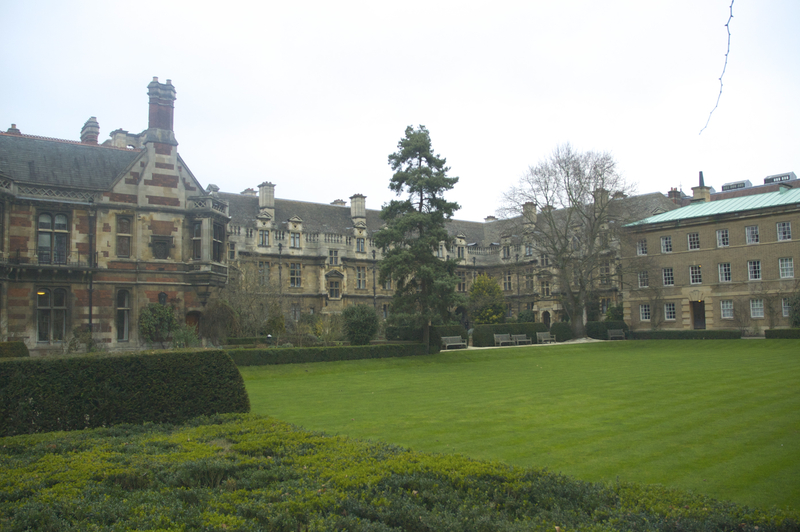 As it was Newton’s own copy, one can see his corrections in the margins to the book’s errors. 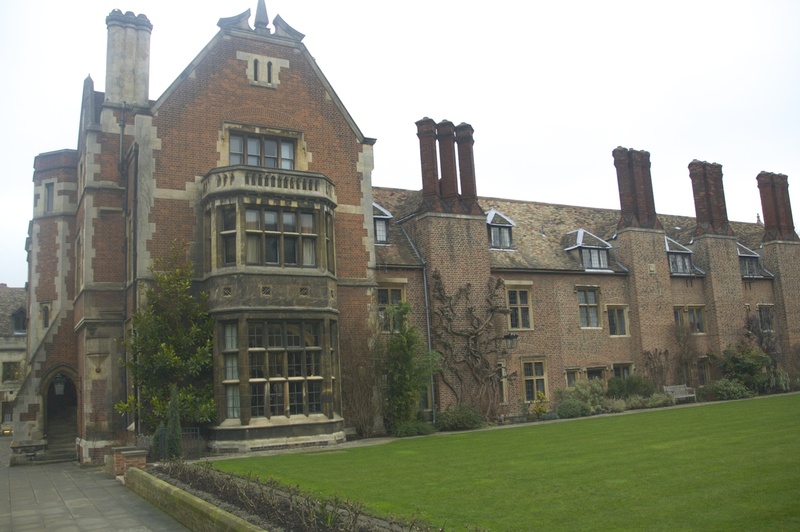 It is well worth the visit. 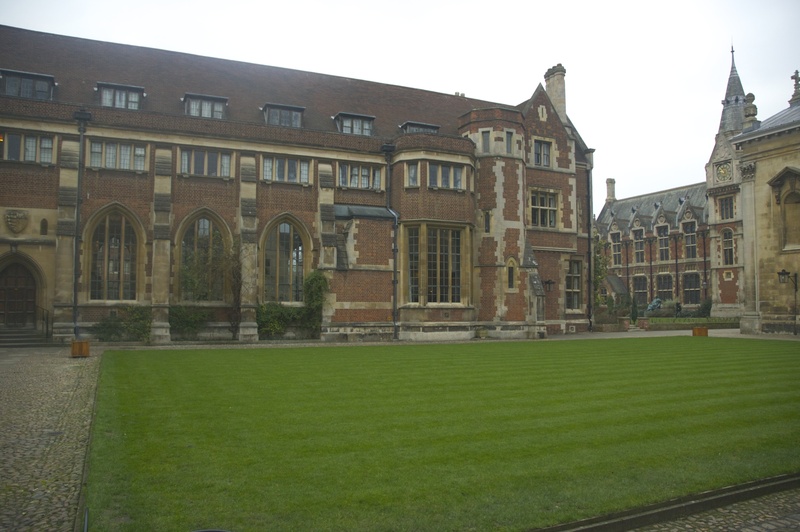 The Wren library, where Newton’s original copy of Principia Mathematica is on display, with his handwritten notes in the margins. 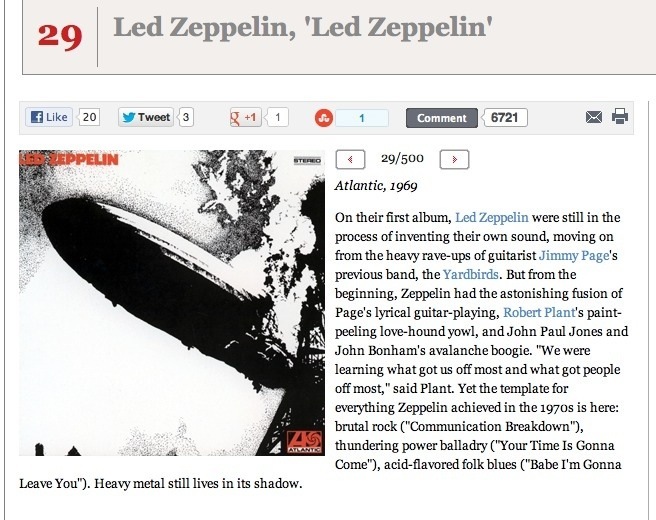 In the Rolling Stone list of the 500 greatest albums of all time, number 29 is the 1969 eponymous album “Led Zeppelin”, the band’s first album. I own one Led Zeppelin album, Led Zeppelin IV, which has their most famous song “Stairway to Heaven” on it. I do not own this, their first album, not have I ever heard any of the songs on it! Does anyone think it deserves to be at number 29? Or higher? Or lower? I was recently being taken to the BBC for an interview, which is about the only time I ever get to travel in a taxi. On this particular day, when the taxi driver asked me what I did and I told him I was an astronomer, he started asking me about extra-terrestrial civilisations. I suggested he watched this wonderful movie, Contact, based on the book that Carl Sagan published in the mid 1990s. 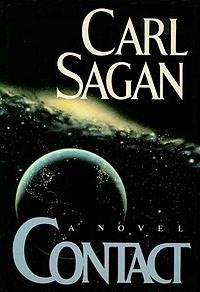 Sagan then co-wrote the screenplay for the movie with his wife. The movie stars Jodie Foster and Matthew McConaughey. Sadly, during the filming, Sagan died of cancer. If you enjoy the film I would highly recommend the book. 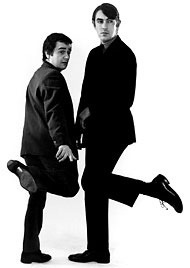 The book has some interesting additional complexity, which I won’t go into as otherwise I will give away the surprises. But it s a fantastic read from one of the most gifted scientists and science communicators of the 20th Century.